Chinese PC manufacturer Lenovo has agreed to a deal with Google to acquire smartphone maker Motorola Mobility, it has now been confirmed. Less than three years after paying $12.5 billion (around £7.5bn, AU$14bn) to acquire it, Google is parting with Motorola for a mere $2.91 billion (around £1.8bn, AU$3.5bn) in cash and stock. The sale represents a stunning loss for Google, which has already recouped some of its outlay by selling Motorola Home to the Arris Group for $2.3 billion last year. However, Google will retain the "vast majority of the Motorola patent portfolio," believed to total around 10,000 patents, which was thought to be a key reason the company bought Moto in the first place. The sale does see Google acknowledge its expensive failure to turn around Moto's fortunes. The 'Made in the USA' Moto X made headlines, but struggled commercially, and the low-cost Moto G impressed but had limited scope for profit. However, for Lenovo, the world's largest PC manufacturer, the deal represents the culmination of a long search to acquire a major smartphone company. The company had previously expressed interest in BlackBerry, while a bid for HTC was also rumoured last year. Following reports on Wednesday afternoon in the New York Times, Lenovo confirmed the acquisition to TechRadar in an official news release. "The acquisition of such an iconic brand, innovative product portfolio and incredibly talented global team will immediately make Lenovo a strong global competitor in smartphones. We will immediately have the opportunity to become a strong global player in the fast-growing mobile space," said Yang Yuanqing, chairman and CEO of Lenovo, said in a media release. 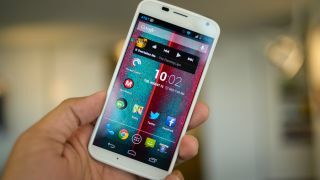 Google CEO Larry Page said Lenovo has the expertise to turn Motorola into a major player within the Android ecosystem. "Lenovo has the expertise and track record to scale Motorola Mobility into a major player within the Android ecosystem. This move will enable Google to devote our energy to driving innovation across the Android ecosystem, for the benefit of smartphone users everywhere," he said.